Behind all of Trump's boneheaded policies in the Middle East is an unmistakable urge for confrontation with Iran. The nuclear deal that Iran signed with the five permanent members of the UN Security Council plus Germany and the European Union is hanging by a thread. The Saudi war in Yemen is really directed at…Iran. Donald Trump’s first overseas visit to Saudi Arabia and Israel was specifically targeted at…Iran. The Saudi-led isolation of Qatar is actually about…Iran. The escalation of U.S. military actions against the Syria government is… well, do I really need to spell this out any further? Other threats that have appeared at one time or another in the administration’s rotation include China, Cuba, the mainstream media, former FBI director James Comey, and Shakespeare (for writing Julius Caesar and then somehow, from the grave, persuading the Public Theater to run a scandalous version of it). Through it all, however, Iran has loomed as the primary bogeyman of the Trump crowd. 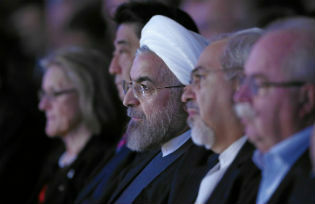 Fear of Iranian influence has prompted the administration to all but cancel the 2015 nuclear deal, intensify a number of proxy wars, consider pushing for regime change in Tehran, and even intervene in the mother of all battles between the Shia and Sunni variants of Islam. You’re worried about Trump and the nuclear football? The prospect of blowback from an all-out U.S. assault on the Islamic State keeps you up at night? A preemptive strike against North Korea, which Mattis acknowledges would be disastrous, has you rethinking that upcoming trip to Seoul? Sure, those are all dystopian possibilities. But if I had to choose a more likely catastrophe, it would be a direct confrontation between the United States and Iran. After all, everything seems to be pointing in that direction. The nuclear deal that Iran signed with the five permanent members of the UN Security Council plus Germany and the European Union is hanging by a thread. Trump made no bones about his distaste for this Joint Comprehensive Plan of Action (JCPOA). He promised to tear it up. He hasn’t done so. It’s not just that he’s gotten pushback from the usual suspects in Washington (diplomats, foreign policy mavens, talking heads, journalists). Even members of his inner circle seem to see value in the agreement. Mattis, who is otherwise hawkish on Iran, has stood by the JCPOA and diplomacy more generally. Secretary of State Rex Tillerson has, albeit reluctantly, acknowledged that Iran has lived up to its side of the agreement. Then there are all the American jobs on the line from the Iranian purchase of Boeing jets. Even though Trump hasn’t torn up the agreement, he has certainly attempted to give it a good crumple. He has directed the Treasury Department to apply additional sanctions on Iran’s missile program. He’s considering the option of declaring the Revolutionary Guards a terrorist organization. Congress, meanwhile, is pursuing its own complementary set of sanctions against Iran (though, because it’s bundled with sanctions against Russia, the legislation may not meet Trump’s approval). None of this violates the terms of the JCPOA. But it challenges the spirit of the accord. Talk about bad taste. After September 11, Iranians gathered for candlelight vigils to mourn the mostly American victims of the attacks. The Iranian government didn’t say anything about chickens coming home to roost after U.S. military interventions in the Middle East, for that would have been inappropriate (though accurate). But Iran might yet have to make a statement that echoes Trump’s tone-deaf remark: States that tear up international agreements risk falling victim to the evil they promote. The conflict is escalating in Syria, where Iran backs the regime of Bashar al-Assad and the United States supports a shifting set of anti-regime groups. Both countries could decide to team up against the Islamic State. And indeed, Iran launched a missile attack against ISIS in Syria this last weekend in retaliation for the terrorist attacks in Tehran. As after September 11, when Tehran and Washington briefly worked together, cooperation against Sunni extremists would seem a no-brainer. Three times in the last month, the U.S. military has come into direct conflict with the combined forces of the Assad regime, Iran-supported Shiite militias, Hezbollah, and possibly even Iran’s elite Islamic Revolutionary Guards Corps. The clashes have reportedly resulted in the deaths of a small number of pro-regime forces, and are much more strategically important than the much-ballyhooed U.S. air strike on the al-Shayrat airfield back in April in response to the Assad regime’s use of chemical weapons. Several administration figures, notably Ezra Cohen-Watnick and Derek Harvey in the National Security Council, are eager to confront Assad and his Iranian backers more aggressively. Mattis, however, has reportedly opposed several of their risky propositions. Regardless of the Pentagon chief’s somewhat more risk-averse behavior, both Iran and the United States are maneuvering to control as much territory as possible in the vacuum created by the collapse of ISIS. How soon the Post forgets. The Iraq War against Saddam Hussein begat the war against the anti-occupation forces, which in turn generated a war against the Islamic State, which now promises to escalate into a war against the axis of Russia, Iran, and Syria. Thus have so-called national interests morphed into endless war. Meanwhile, over in Yemen, the Saudis are bogged down in a war of their own that’s going nowhere (except in producing a severe humanitarian crisis). The Trump administration has been mulling for several months a boost in U.S. participation in that war. At the least, this would mean lifting certain restrictions on the assistance Washington is already providing the Saudi-led coalition — surveillance, refueling, and the like. Then there are the additional arms that Trump wants to provide Riyadh. Now that the Navy SEALS have conducted two raids in Yemen under Trump — the most recent taking place last month — the prospect of more permanent boots on the ground may not be far off. Recall how the United States became involved in Vietnam to help out the failing French in order to prevent presumed Soviet expansion. Yemen, where we may yet send troops to help the failing Saudis prevent presumed Iranian expansion, is the very definition of quagmire. Our policy towards Iran is to push back on this hegemony, contain their ability to develop obviously nuclear weapons, and to work toward support of those elements inside of Iran that would lead to a peaceful transition of that government. It was the first public indication of regime-change sentiment from the administration. But it’s not the only sign. Cohen-Watnick, the liaison on the NSC to the intelligence community, has reportedly confessed to other administration officials of his desire to oust the Iranian regime through espionage. And the fellow that’s now leading the Iran operation at CIA is Michael D’Andrea, otherwise known as the “dark prince,” a long-time operative who is fully capable of pursuing the harder line that Cohen-Watnick wants to see. But wait, didn’t Iranians just overwhelmingly back the reformist Hassan Rouhani in elections last month? This popular government has engaged in domestic reforms and external engagement of the “Great Satan.” In other words, Iranians have changed their own regime — peacefully — since the days of the more confrontational Mahmoud Ahmadinejad. Of course, Washington has overturned the wishes of Iranian voters in the past, helping to overthrow Mohammed Mossadegh in 1953. Whenever oil interests (Tillerson) intersect with chickenhawk ambitions (Bannon), talk of regime change is sure to follow. When Donald Trump said a few nice things about Islam on his first foreign trip to Saudi Arabia, liberals back home breathed a sigh of relief. At least the new president wouldn’t follow senior advisor Steve Bannon’s more extreme narrative of a new crusade against the infidels. But even as he rejected the larger religious frame, Trump has embraced a different kind of war: a clash within a civilization. The battle lines between Sunni and Shia have hardened throughout the Middle East, and Trump is wading into this mess firmly on the side of the Sunni. And not just any Sunnis, but the most extreme Wahhabi version of Sunni Islam as represented by the ruling sheikhs of Saudi Arabia. Let’s be clear: Trump is not making a doctrinal statement by siding with extremist Sunnis. He knows nothing about Islam and is not interested in learning. This is about power — who will control the Middle East. In the past, however, the United States in its infinite naiveté thought that it could control outcomes on the ground in the region. Today, that naiveté has developed into a kind of aggressive ignorance as the Trump administration simply follows the Saudi lead, with Israel pushing from behind. In this way, the United States will be propelled toward war with Iran. But wait, actually, Donald Trump himself anticipated this outcome. We will end up going to war with Iran because we have people who don’t know what the hell they are doing. Every single thing that this administration and our president does is a failure. Who knew that Donald Trump could be so prescient? The president has proven himself high-performing in at least this one regard: self-fulfilling prophecies. John Feffer is the director of Foreign Policy In Focus and the author of the dystopian novel Splinterlands.